Can You Lose Weight Eating Sandwiches? When it comes to a meal in one convenient package, sandwiches are often the first choice. 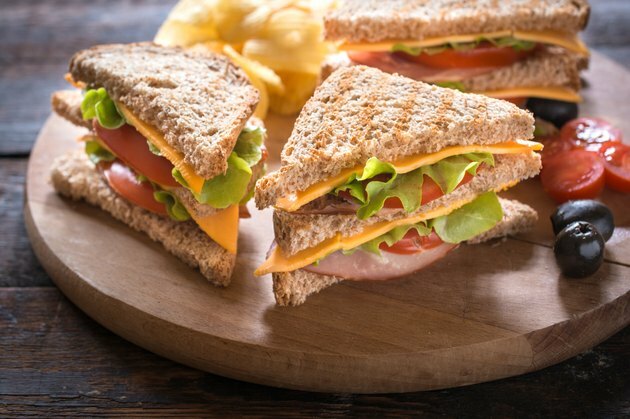 Sandwiches can vary widely in both their calorie content and overall nutrition, because you can put just about anything between two slices of bread and call it a sandwich. So when assembled correctly with healthy ingredients, this convenient food package can serve as a way to lose weight in a tasty and healthy way. Track your healthy sandwich options using MyPlate. Sandwiches start with the bread, and with literally hundreds of different bread choices on the market from basic white bread to sourdough and 12 grain, you can change up your sandwich quickly. When choosing sandwich bread, stick to whole grain options that are high in fiber instead of refined flour white breads. Increasing your fiber intake can help increase your weight loss success by allowing you to feel fuller for longer periods of time, decreasing your risk of unhealthy or excess snacking. When making a sandwich that includes meat, it's important to think about portion sizes. When putting meat on your sandwich, stick to about a 3-ounce serving. Try weighing your meat portions early in the week and sealing each portion in an individual bag. This will take the guesswork out of your meal. Opt for lean meats such as turkey or ham over fattier meats like pastrami. Condiments are a quick way to add unwanted calories to your sandwich, with the main culprit being mayonnaise. When possible, trade out your mayo for low calorie spreads like mustard, low calorie salad dressing or a spray of rice wine vinegar. If you can't live without the mayo, drastically reduce the amount of mayo you use and opt for reduced calorie mayo products, as a single tablespoon of regular mayo can pack as many as 90 calories, according to LIVESTRONG.com's MyPlate. Vegetables and greens are one of the quickest ways to increase the satiation of a sandwich as well as its overall nutritional value. Add as many vegetables as you can to your sandwich, such as shredded carrot, cucumber, tomato and sprouts, and play with a variety of greens as well, including spinach and romaine or a mixture of greens like mesclun. You can use cheese on sandwiches to include dairy into your diet. However, full-fat cheeses or adding too much cheese can increase the overall calorie content of your sandwich, sometimes in quite drastic ways. Consider leaving the cheese off completely. When you do use cheese, limit yourself to one slice, or use options like feta or a light goat cheese spread. As an example, one slice of Swiss cheese contains 106 calories and over 7 grams of fat, which can hinder weight loss. Is Fat-Free Mayo Good for a Diet?